The children of St Ita’s Primary School in Belfast, pictured with Brian McIlroy of the Rory Foundation, Antonia Beggs from the European Tour and Dubai Duty Free Golf Ambassador Des Smyth, will certainly be Roaring for Rory following the launch of a nationwide competition organised by the Dubai Duty Free Irish Open hosted by the Rory Foundation. 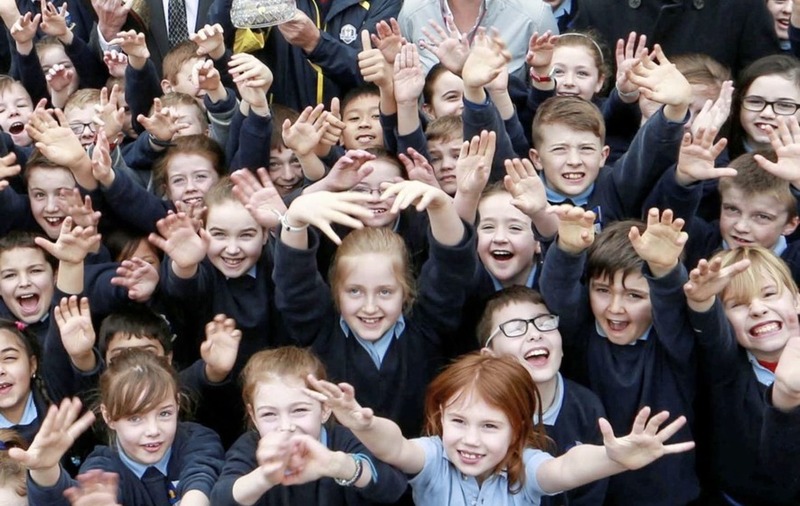 Children of Straffan National School in Co. Kildare help launch the Roar For Rory competition. 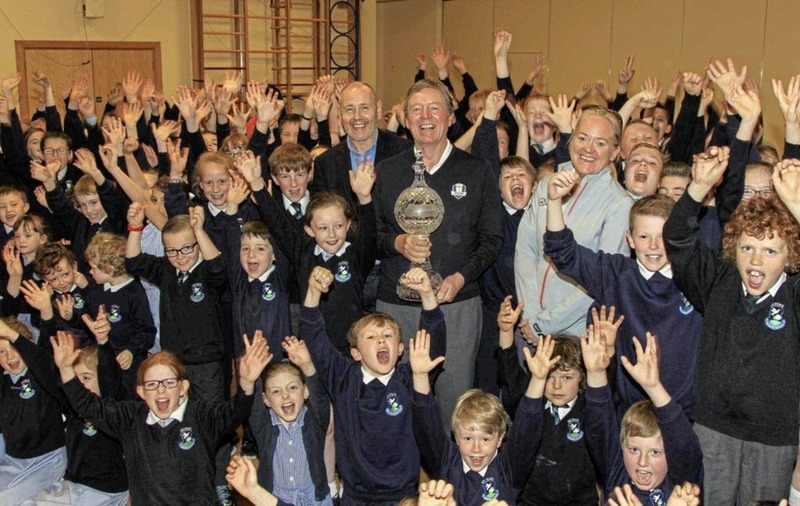 CHILDREN throughout Ireland are being invited to get their hands on the prestigious Dubai Duty Free Irish Open Trophy as part of a competition which encourages them to find creative ways to support their favourite golfers. The Roar For Rory competition, organised by the Dubai Duty Free Irish Open hosted by golfing star Rory McIlroy's Rory Foundation, will give two lucky children across the island of Ireland a chance to win a unique opportunity for their schools to host a visit from the prestigious trophy as well as a Q&A session with representatives of the European Tour and Rory Foundation at their school, and an insight into the life of a professional golfer from Ireland’s Dubai Duty Free golf ambassador Des Smyth. Not only that, the two winning children will each receive a family pass for the Dubai Duty Free Irish Open Pro-Am and a VIP tour with a chance to see Rory and some of the world’s top golfers up close. The 2017 Dubai Duty Free Irish Open at Portstewart this July is set to be the biggest in the tournament’s history, with an increased prize fund of $7million. A portion of all tickets sales this year will go towards the Rory Foundation, established by McIlroy in 2013 to help children live better lives by raising funds and offering support to children’s charities around the world. To enter the competition, children should simply submit a short video or fun photograph of themselves, their friends or classmates shouting "Come on Rory" (or the name of any other player they choose) in support of the Dubai Duty Free Irish Open 2016 champion Rory McIlroy and the other top golfers who will be competing for what has become one of the most sought after titles on the European Tour. 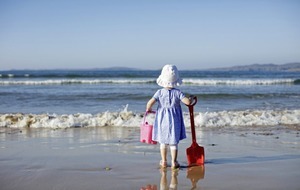 Entries should be sent to roarforrory@duffyrafferty.com along with contact details clearly stating the child’s name, age, address and school. Alternatively, parents and teachers can tweet their videos and photos to @ddfirishopen or post on the Dubai Duty Free Irish Open Facebook page with the hashtags #ddfirishopen and #roarforrory.